A warm glow — and ominous smoke — from this week’s contest entries for the prompt “fire.” Our winner is Juliet Bell, who sent in a beautiful pen-and-ink drawing from her archives. 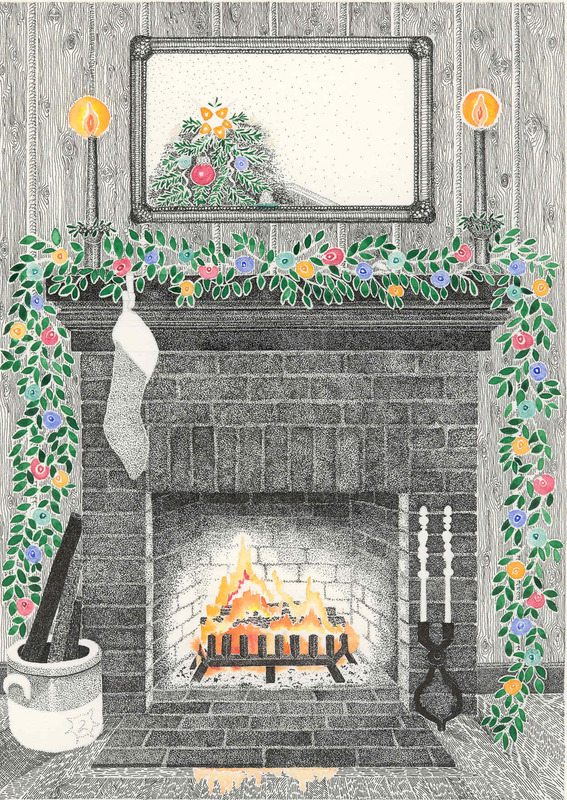 Juliet writes: “I was never happy with the tree reflection, and I can see now there are other things that need fixing, but I did like the way the fire came out.” Totally dreamy, I say. Juliet, your $10 amazon.com gift certificate has been issued. Prometheus’s booty set loose amongst us. Evidence: a match tip burn on my bed. Huh, Not Me, and I Dunno. When I was younger, growing up in Southern California, I don’t remember the wildfires becoming such an annual event, like the tornadoes of the midwest or the hurricanes of the gulf coast. Yes, there were the occasional big fires, like the one that swept through Bel-Air, or the Malibu conflagrations. But they weren’t a ‘given’ with the advent of every Santa Ana wind. Times have changed. With so many more million people living here it only takes one or two small accidents to spark a firestorm. A welder’s spark. A bird landing awkwardly on a power wire and blowing out a transformer. A carelessly put-out cigarette. A car parked on dry grass where the catalytic converter can cause a sudden flame. And those are accidental starts, we’re not even considering the cases of arson. When the Santa Ana winds blow in October and November, nowadays the smallest error can cause hundreds to lose their homes and even some loss of life. I don’t see a solution to this problem. We are out of dwelling space as homes are built among chapparal hillsides. Even with a defensible space, embers fly for miles, igniting rooftops far away. 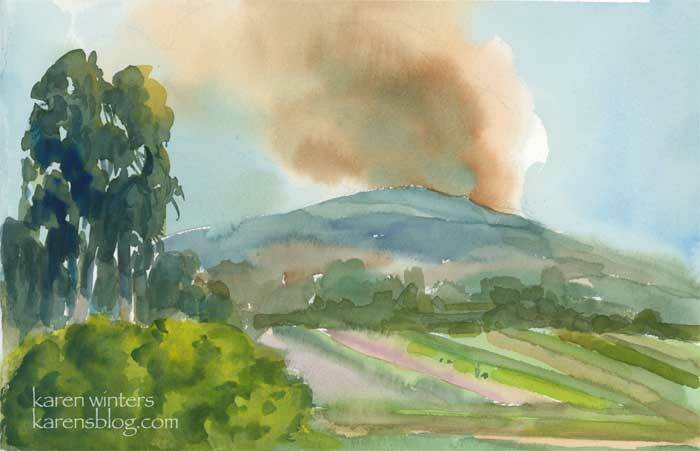 Several years ago there was a big fire in Ojai. I don’t live there, but we were driving up the coast to Santa Barbara and saw the plume soon after it had begun. I painted this in my sketchbook to remember the occasion. 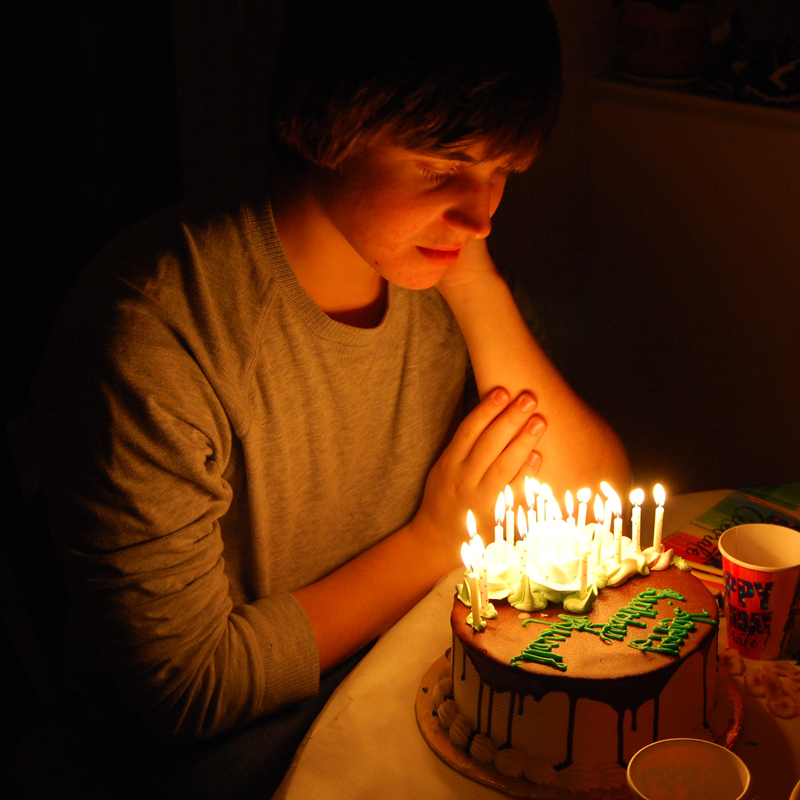 From me (Miranda): My firstborn son, Russell, turned 18 last night. It was hard not to focus on the fact that I probably won’t be seeing him on his birthday again for quite a while — at least for the next four years. A happy birthday evening, but bittersweet. Use the prompt however you like — literally, or a tangential theme. All media are welcome. Please e-mail your entries to creativereality@live.com by 10:00 p.m. eastern time (GMT -5) on Tuesday, December 16. The winning entry receives a $10 gift certificate to amazon.com. Writers should include their submission directly in the body text of their e-mail. Visual artists and photographers should attach an image of their work as a jpeg. Enter as often as you like; multiple submissions for a single prompt are welcome. There is no limit to how many times you can win the weekly contest, either. (You do not have to be a contributor to this blog in order to enter. All are invited to participate.) All submissions are acknowledged when received; if you do not receive e-mail confirmation of receipt within 24 hours, please post a comment here. Remember, the point here is to stimulate your output, not to create a masterpiece. Keep the bar low and see what happens. Dusting off work you created previously is OK too. For more info, read the original contest blog post. wow, juliet, the wood grain alone is as intricate as intricate can be! then i scrolled down, the pointilist bricks shading is stunning. karen, i can really feel your esayette and painting, smell the smoke. miranda, beautiful glow! i can see your wistful maternal moment here. i would like to let everyone know that the fact i was able to discover what i discovered in my room is pretty dumbfounding, as i have hidden the matches in my room (for candle lighting purposes only) so well, i can’t find them. the fact i was able to breathe deep, let it go, and ‘laugh’ about it is even more amazing, as i survived a fire when i was 19 which destroyed all my prior artwork and everything else i owned, in a dorm fire. the only thing left unscathed was my little book of poems, as at that time i was a ‘secret writer’. i took that as a sign and ‘became’ a writer. but i am also paranoid about house fires, and am always moving papers away from the toaster, etc, while admonishing the dangers. conversely, i was quite the pyro as a kid and love a good campfire. My new spam filter seems to have blocked creativeconstruction, so I’ve just discovered I have a gift certificate – Thank you! And thanks for the nice remarks, Cathy. That IS odd about the match appearance – sounds like a message from someone – here or in some other dimension. My brother and I were pyos as well – if it hadn’t been for our older sister who discovered us building little fires in the cellar, could well have burned down our apartment bulding. Karen, the colors in your sketch are wonderful – what a good eye you have! Miranda – LOVE that photo of Russell – one wonders what he is thinking. congrats juliet! i echo cathy’s amazement at the details! wow! cathy, i’m scared to death of fire…my dh really wanted a gas stove in our house and i wish i would have never given in. it makes me very paranoid. karen…i have a close friend who loves out your way, in long beach, just south of la. i always worry about them! and now you! love your sketch. miranda, i have to say, i love your entry the best this week. that’s a magical photo given your sentiment behind it. Congratz Juliet, nice work! Great job everyone, great to see so many different takes on the theme. Cathy, that’s awful. What a huge loss. for me to be fired. though he didn’t know that.